Two one-loss teams are set to battle for a spot in the state semifinals. The Troy Trojans are riding an eight-game winning streak after falling 50-14 to Class 3A’s Centralia in the second week of the season. Other than that game, the fifth-ranked Trojans have been a strong defensive team. Troy has posted four shutouts and limited opponents to seven points or fewer in seven of 10 outings. The defense also has seemingly gotten better. Troy allowed 25 points to Valley Heights in Week 3 but gave up only six points in last week’s rematch in the playoffs. Troy quarterback Tristan Speer has completed 140 of 206 passes for 2,143 yards and 34 touchdowns with only one interception. Derek Franken is the team’s leading rusher with 618 yards and seven touchdowns. Collin Jasper, Cuttar Huss and Jake Ross all have more than 500 receiving yards. Speer leads the defense with four sacks. The fourth-ranked Lyndon Tigers are enjoying a three-game winning streak after falling 36-28 to Olpe. Lyndon boasts a lot of offensive firepower, averaging more than 400 yards of total offense per game. Senior quarterback Dawson Swinehart has rushed for 1,825 yards and 30 touchdowns and has passed for more than 730 more yards and six scores. In last week’s 61-40 shootout win over Marion, Swinehart rushed for 258 yards and five touchdowns while passing for an additional 164 yards and two scores. In addition to Swinehart, senior Daniel Burgess has rushed for nearly 1,100 yards and 16 touchdowns. On defense, senior Gabe Leuszler has recorded 12 sacks. This game is a rematch of last year’s quarterfinal game won by Lyndon 37-8 at Troy. Perennial playoff contender Olpe will face an Onaga team that finished just 3-6 a year ago. The third-ranked Olpe Eagles fell 28-8 to top-ranked La Crosse during the season opener. Since then, the Eagles have rattled off nine consecutive victories, including a 36-28 win over Lyndon. Olpe quarterback Bo Krueger rushed for four touchdowns and passed for another during last week’s 56-14 playoff victory against Mission Valley. The Onaga Buffaloes held a 1-3 record after suffering a three-game losing streak to Washington County, Centralia and Troy. Since then, Onaga is on a six-game winning streak that includes a 13-12 win over Valley Heights and a 28-26 win over Valley Falls. Senior Michael Bliss led Onaga with about 1,000 yards rushing during the regular season. Bliss rushed for 133 yards and two touchdowns on 25 carries in the first-round win over Doniphan West. Quarterback Wyatt Cordell rushed for almost 800 yards during the regular season. La Crosse made a statement last week with its 34-0 blowout of the Meade Buffaloes. The Leopards now have the target on their backs with the No. 1 ranking headed into playoff quarterfinals. They will entertain the Ell-Saline Cardinals who are coming off a 28-20 win over Sedgwick in the first round of the class 2-1A playoffs. Ell-Saline avenged a 44-12 loss to Sedgwick in Week 3 of the regular season. The Cardinals bring in a 7-3 record and are receiving votes in latest poll rankings. La Crosse loves to run. They have rushed for 2,450 yards and 28 touchdowns in ten games this season. The Leopards have relied heavily on their senior leadership and the stats show it. Seniors Andrew Jay (750 yards, 7 touchdowns), Sheldon Schmidt (773 yards, 12 touchdowns), and Jack Garcia (823 yards, 6 touchdowns) have combined to rush for 2,346 yards and have scored all but three of the teams 28 rushing touchdowns. It just seems like it might be La Crosse’s year to break through with a state championship. But Ell-Saline might have something to say about that. The Cardinals are winners of four of their last five games and at home, Ell-Saline is right where it wants to be. If the Cardinals can keep it close they will be in familiar territory. Ell-Saline is 4-1 in games decided by 12 points or less. La Crosse is in full stride and riding a six game winning streak. I see it extending to seven games. Phillipsburg and Oakley meet for the second time this season. The Panthers got the best of the Plainsmen in their first meeting with a 49-21 win. Phillipsburg has won eight consecutive games, while Oakley is a winner of five of its last six games. The Panthers escaped a first round knockout from Sacred Heart with a 22-15 double overtime victory. Quarterback Sam Sage threw a touchdown pass in the first overtime and then sealed the win with an interception on Sacred Heart’s second possession. Phillipsburg is all about the running game. In fact of their 3,461 yards of total offense, 3,230 of those yards have come on the ground. 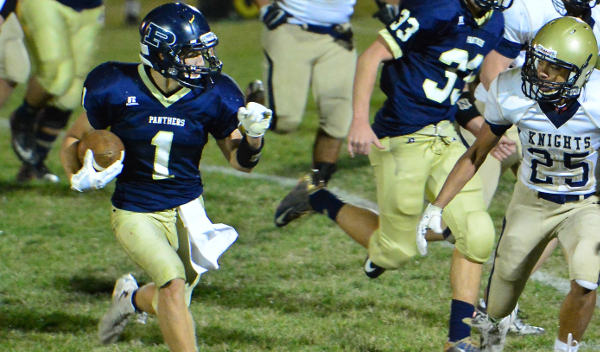 In the first meeting with Oakley, the Panthers rushed for 441 yards and six touchdowns. Senior running back Stuart Lennemann leads the team with 1,209 yards and 16 touchdowns. Lennemann broke free for 188 yards and three scores in the first meeting. I don’t see the Panthers to change their game plan. Expect Phillipsburg to ride their running game and Lennemann’s legs all night. Oakley gets another chance at the No. 2 ranked Panthers, this time there is much more at stake and this time it is on their home turf. The Plainsmen have fallen to Phillipsburg in each of the past four seasons, including the Week 3 meeting. Oakley has overcome an early-season three-game losing streak to win four straight before a 27-21 overtime loss to La Crosse. Those early season losses came to good teams in Smith Center, Norton, and Phillipsburg. First-year coach Ty Pfannenstiel has the Plainsmen playing more consistent football at the right time. The revenge factor might play a key role in this matchup, but I think the Panthers control the time of possession and the line of scrimmage throughout and advance to the semifinals.